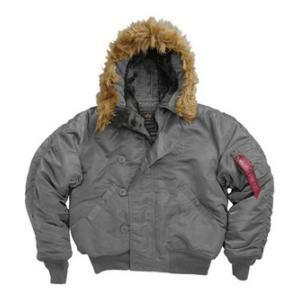 The Alpha N-2B parka is a waist jacket. The Alpha N-2B parka has wind-resistant nylon outer shell that keeps cold out without excessive bulk or weight. This makes the Alpha N-2B parka the ideal jacket for cold or mild winters. The Alpha N-2B parka comes with a full-wrap storm front with zip closure, knitted waist and cuffs, features a faux fur trim on the hood, and the hood unzips to lie flat on your shoulders. US materials sewn overseas to military specs.